I recently surveyed my subscribers and facebook group. About the most significant challenge that they were facing right now and the type of help, they would like to read about on this blog. The results were very informative and helpful. What came out was a request for help on how to create a brand based on what makes you unique, also understanding who is your ideal client, getting clear with your branding (aka brand clarity). It does not only go back to brand clarity but understanding yourself, who you are as a person and your values. So brand clarity and styling are a big request. Another challenge that came up is how to get more engagement and clients. I will publish more posts on the blog about these topics in the next coming week. This week and next I will focus on how to develop a tribe, get more engagement and convert them into customers. 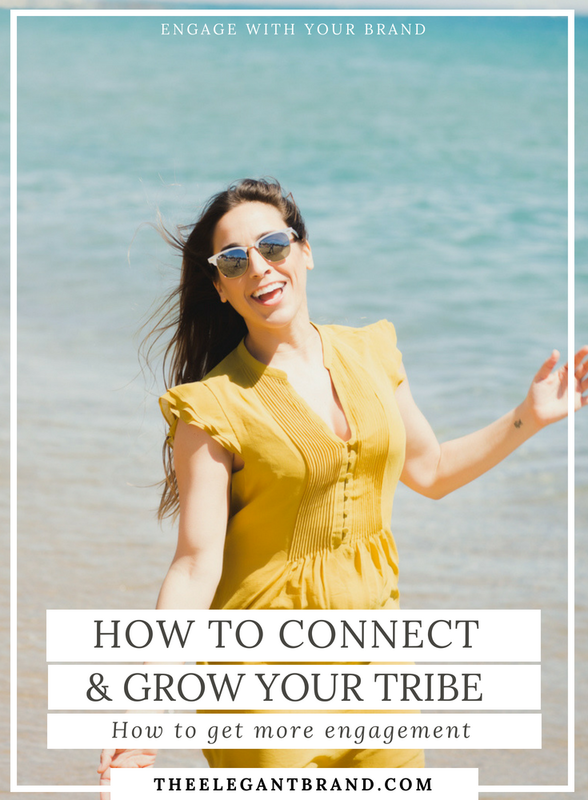 I think we would all like our followers to become our clients, I will be honest with you, there's a whole process to put into place, and it will take time and a lot of engagement on your side, showing up and helping your ideal client (tribe) for it to happen. As I've exposed in a previous blog post, the way we do marketing has changed. What your prospective clients are looking for, is to get to know you better, understand what you can do for them and start a relationship with you. Often this relationship begins via social media but how do you convert these followers? Do your followers know what you do? How can you help them? I'm not talking about continually doing promotions rather starting a conversation, social media is not the place for your sales pitch, it's an introduction to what you do and who you are. What are the recurrent themes that you publish on your social media, i.e. behind the scenes, work with a client, travel, what inspires you etc...these will create an inspiring story for your followers wanting to know more about you, you can then invite them to take action. Create a post to introduce yourself to your followers, create a post to introduce your shop if you have one, explain what you do, for whom and the problems you solve. Write a post where you introduce your current work, promote your case studies when working with a client. Think about variety in your posts, don't forget to show your human side, to help people connect with you. Inviting captions will create more engagement, ask a question, share exclusives, give them a reason to follow a link off the app, do a contest, ask them to tag their favourites, add calls to action, i.e visit my shop, your website, offer a freebie. The purpose of a sales funnel is to give your ideal client the opportunity to test you, your customer service and products without taking too many risks. What do I mean by that? If your products and services have a high entry price, no one will buy your services without knowing you in some form or another, being referred to, or having started a relationship with you. The idea of a sales funnel is to create a lower entry price packages/ product/services. Ie. If you're selling website designs at $3000 your entry product, could be a free consultation, an ebook about the must-haves your website needs to deliver. The aim is to get these people connecting with you on your mailing, list, start a relationship with you, by reading one of your books and keeping in touch via your mailing list. I know that you would like me to give a quick solution, but if you want clients to come back to you and refer you, you have to think long-term and developing a relationship first, you don't just want a one-off sale, you want to create recurring sales and get referrals. If you're too stressed about the money, try to find another way to sustain your income, take the pressure off of selling and keep growing these relationships. Once you've started to develop these relationships, don't forget to ask for the sale! This one of the biggest mistake I see with new starters, they want to sell off from day one and don't understand why it doesn't happen. I've been there, made every mistake in the book as I was convinced that because I loved my products, people would buy them. Wrong, I was so wrong, ( I will tell more of this story in my forthcoming ebook). In a crowded market where it's very difficult to stand out of the crowd, no one will feel the same about your products /services as you do, why? They don't know you, you're selling a product instead of a story and are not clear about what's in it for them. When you're in business forget about you! It's not about YOU. You have to put yourself in your ideal client's shoes. When you look at your products and services, imagine your client, what is her most burning pain point when you consider your products/services, what is the solution you offer for what problem? I understand that it's more complicated to solve a problem when you're selling a product than a service but you still need to have clarity about your ideal client and the story behind your products. Why would she choose yours compared to B? When you sell a product you have to sell the story, showcase studies about your products / services, tell the story how it's made, sell your values, i.e part of the sale will be given to charity, if you're selling art, painting, why not offer a framing service, show how your painting are looking on the wall. I hope you've found these tips helpful stay tuned for the second part of post next week, with idea to connect via collaborations and extending your services. PS. add in your comments the tip you've found the most helpful! Still struggling about defining your ideal client? Get the guide!